Seeing the Mona Lisa at the Louvre is a bit disappointing. Once you get past the crowds and manage dodge the hoards of pickpockets and swarms of fake beggars that fill the Louvre's halls and corridors its actually rather small, not colourful at all. Its actually in quite poor condition with lots of surface cracks. I actually preferred visiting the Musee des Beaux-Arts in Rouen to the Louvre in Paris. Its free and packed with impressionist masterpieces. Unlike the Mona Lisa, Holbein the younger's 1533 painting The Ambassadors, does not disappoint. Its huge, it has a anamorphic skull, two very detailed portraits and a showcase of cutting edge Tudor scientific instruments. Elizabeth I was born in 1533, the same year the Ambassadors was painted and 31 years before Shakespeare was born. However, the pace of technological progress in the 16th century was not what it is today and the instruments shown in the Ambassadors would still have been familiar in Shakespeare's time. From left to right we have a shepherd's dial, an equinoctial dial, a quadrant, a polyhedral sundial, a torquetum. The settings on the instruments are thought to be a code and indicate Good Friday. There is also night globe and day globe on display with the French city of Polisy shown. The figure on the left is Jean de Dinteville Seigneur of Polisy and Ambassador to Henry VIII in 1533. The figure on the right is George de Selve Bishop of Auxerre. 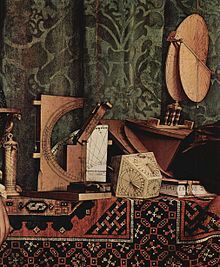 The torquetum (next to the Jan de Dinteville's head) is interesting in that is a type of analog computer which measured the horizon, equatorial and elliptic. What is even more interesting is that the base of the torquetum resembles a modern telescope mount and not unlike the equatorial mount I have on my Konus 8" reflector. At aligns with latitude and then with the pole star with two sets of movable pivots so that the astronomer can follow a star by simple rotation of the device with one hand leaving the other free to make notes and measurements. 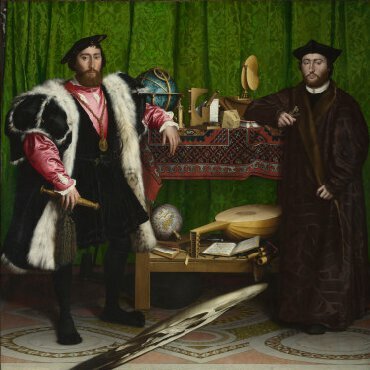 However, the cutting edge technology on display in Holbein the younger's painting is missing one element considered critical to modern astronomy. Optics. There are no lenses or mirrors on display. It might be argued that the painting itself is one optical trick as the skull can only be viewed from one angle. Astronomers would have to manage without lenses for a few more years but when the telescope was invented it changed astronomy forever. If Holbein has lived 100 years later and painted his painting in 1633 he would have almost certainly have changed some of the instruments on display to reflect scientific progress. The National Gallery in London is free to visit (although they do ask for donations if people can afford them). Go early in the day or late to avoid the crowds to view this masterpiece of Tudor art which does not disappoint.